The 105th Grey Cup was held in Ottawa on Sunday where the Toronto Argonauts defeated the Calgary Stampeders 27-24 in a thrilling contest. The party was on in Toronto after the game was all said and done, but it all started in Toronto, hours before kickoff. Outside the home of Argonauts where hundreds gathered outside of BMO Field with other fans to get ready for the big game. The so-called “tailgate party” outside of BMO Field started a whole four hours before kickoff where fans who are complete strangers end up friends by the end of the night coming together barbequing, having conversations in between and getting in some pre-game drinks. “The outcomes are crazy. There’s always so many people that show up to these tailgates, it’s great,” says Kyle Smith, a supervisor for the tailgates that happen almost yearly. He adds he’s also been around the last time the Argos brought home the Grey Cup in 2012. These tailgates are open to all ages, with a $4 entry fee at the gates or with tickets from Argonauts.ca or ticketmaster.ca. After gathering and coming together with one another at the tailgate, some went off to local bars and the biggest sports bar in Toronto, Real Sports Bar, where the game was shown on the big screen TV. As the game intensified and the game became closer as it neared the end, the time between plays the packed Sports Bar got quiet, until that final whistle blew and the Toronto Argonauts won the 105th CFL Grey Cup and all those nerves went away and the celebration began. Shortly after winning the Grey Cup it was announced that the Argonauts would be back home on Tuesday for a parade in Toronto at Nathan Phillips Square, where the turnout was massive and thousands of fans showed up to celebrate with the team, coaches and staff. “This is fun, it’s great to see the future of Toronto sports coming around, this is just a little extra for us as a fan of all Toronto sports,” says Pete Baker, a senior who has been a fan of all sports around Toronto for decades. 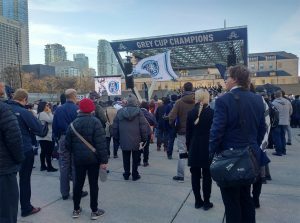 Although this Argos Grey Cup celebration might be over, more exciting times might be still to come with Toronto’s MLS soccer team playing in their crucial playoff game on Wednesday for another shot at the MLS Championship after falling short last season. BMO Field is getting some more championship banners, courtesy of the Toronto Argonauts.